Shortly after the dramatic fire consumed much of the TVCC tower in Beijing earlier this year, we speculated on the building’s fate. Well, it’s taken eight months, but Archinect directed us to an AP story in which OMA’s Ole Scheeren finally addresses the rampant concerns that have been plaguing the burned out building, and the prognosis is good. Scheeren said that the building is indeed intact and will be replaced—at what cost, who knows, though this being state-run television, does it even really matter? The AP adds that construction scaffolding is already up on the site, and Scheeren goes to great lengths to dispel apparently rampant and, as far as we can understand, ridiculous rumors that were the TVCC building to be dismantled, it would drag down the better known CCTV building because the two shared a structural system. Scheeren said the main buildings were not damaged. 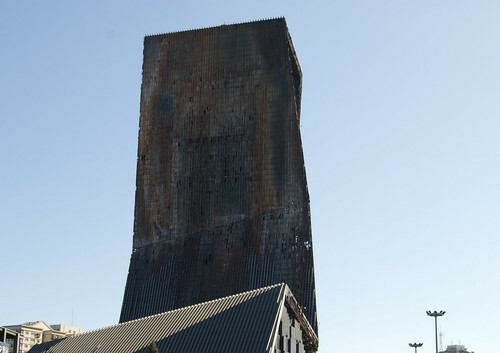 He said there is no truth to persisting rumors that the towers and the burnt-out building were interconnected and served as a counterweight for each other. 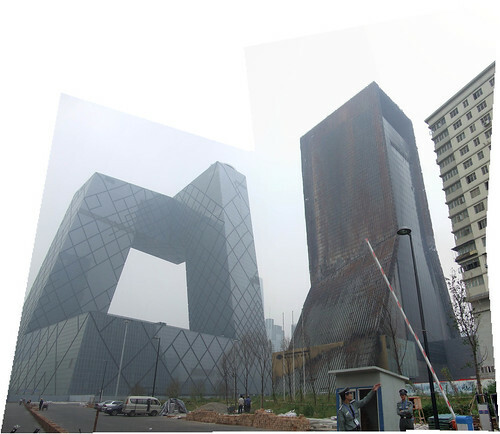 “The two buildings are completely unrelated structurally. There’s no connection between them. I think it’s very important to dispel this kind of story that the two buildings are connected and one depends on the other. That’s absolutely not true,” he said. Rumors have swirled for months that the delay in reconstruction was partly because the two buildings were linked to each other and that it would be impossible to tear down the smaller building without affecting the main one. This seems like a no brainer to us, but maybe it’s an East-West thing. What’s more impressive, and important, is that the building remains intact. This is not to say most buildings would not under normal circumstances, but China is not exactly known for building under normal circumstances—the terrible destruction wrought last year on inadequate buildings during the Sichuan earthquake is only the latest example, though we’ve heard countless reports from architects about substandard building practices, too. It is comforting, amid the devastation, to know that things could have been worse, and hopefully they’ve gotten better for good. Whether it was Rem demanding appropriate amounts of intumescent paint and the proper gauge steel or the Chinese matters not, so long as the the events of last February are not forgotten.